Welcome to the official website of Lisa Siciliano. Please choose from the pages listed above. Lisa recently attended an acting master class at the Acting Studio Chicago with Chicago directors James Bohnen of Remy Bumppo, Amy Morton of Steppenwolf, and Ann Filmer of 16th Street Theater. Lisa has recently been made Education Associate with The State Theatre of Chicago. Lisa was recently named staff with The Chicago Fringe Festival 2009. 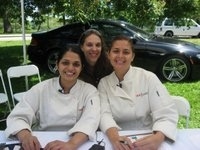 Lisa with two Top Chefs in Chicago, 2009. Lisa at the finish line for the Susan G. Koman Race for the Cure 10K. Lisa and the John Hancock Building, Chicago.